The Essence of this deep blood red Frangipani was made on the coast near Darwin in the Northern Territory. It is unusual in that it does not have the sweet aromatic quality of other Frangipanis but rather a very heavy, musky odour. 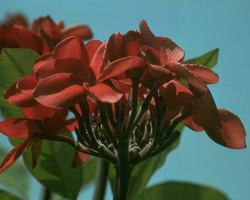 Its common name in the Pacific is "Bleeding Heart Frangipani". This Essence addresses the great emotional intensity, difficulty and hardship that people can go through when a relationship is ending, close to ending or going through a very "rocky" period. It can also be taken for the enormous initial pain and sadness of the loss of a loved one. The person can be feeling greatly disturbed, not suicidal as in the case of Waratah, but torn apart by the event or situation. Sturt Desert Pea deals with unresolved grief from the past.